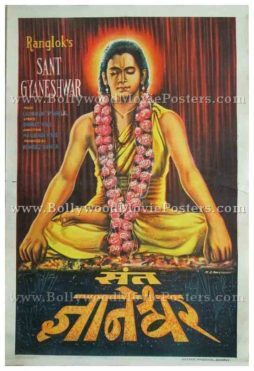 Old Bollywood movie poster of the black and white devotional film, Sant Gyaneshwar (1964) for sale. This vintage Bollywood movie poster features a stunning hand painted portrait of the lead actor in deep mediation. A bright orange yellow halo is painted around his head to give him a godly, saint-like appearance. This old Bollywood poster was originally designed in hand painted oil on canvas format. The printed signature of the Bollywood poster artist is seen on the bottom right.